A River Runs Through Us! This is a sobering warning from the Lord Jesus to His church at the end of the first century. This church was doing everything that He wanted of them, but one thing. In their zeal for the Lord, the “things” of “doing church” had replaced their love for Him and for one another. Sound familiar? But, God is doing something to remedy that problem. How many of you have felt this special move of God in your hearts, lately? It is like a river flowing out of your belly… a river of His great love that seems to have no end and who’s intensity just keeps growing! God seems to have sent His Spirit into us to restore the love we once had in those early days when Jesus first came into and made His abode in us. I have been totally taken by the love of the Lord over the last few weeks! 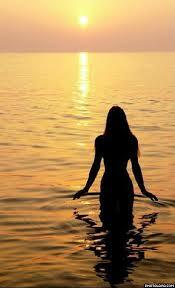 It is so strong and it is flowing out of me for all who He puts me in touch with, even on the internet! In the last day, that great day of the feast, Jesus stood and cried, saying, “If any man thirst, let him come unto me, and drink. He that believes on me, as the scripture has said, out of his heart shall flow rivers of living water.” (But this spoke he of the Spirit, whom they that believe on him should receive: for the Holy Spirit was not yet given; because that Jesus was not yet glorified.) (John 7:37-39 KJ2000). Yes, this flow is of the Spirit of God and the fruit of the Spirit is love, joy, peace… I have been experiencing all of these aspects of His fruit flowing out of me and it is exciting, but the most intense of them is His love and with it the joy of the Lord springs up in me as well. This river is His healing power for dry and thirsty souls. In Psalms we read, “There is a river whose streams make glad the city of God, the holy habitation of the Most High. God is in the midst of her, she shall not be moved; God will help her right early.”(Psalms 46:4-5 RSVA). You see, with this river of love comes great joy that makes us so glad to be in the City of God and among His people! Now couple this last passage with what David says here, “How precious is thy steadfast love, O God! The children of men take refuge in the shadow of thy wings. They feast on the abundance of thy house, and thou givest them drink from the river of thy delights. For with thee is the fountain of life; in thy light do we see light.”(Psalms 36:7-9 RSVA). Here we see the love of God, the river of God, and His fountain of living water which brings Light and Life! It is all the same flow coming down from the throne of God and flowing out from we who are IN the flow of His Spirit as His individual streams that make up the river. So, as I contemplated how this love of God flowed from me to those who were also in the river it was like it was a continuum that replenished itself. The more I let his love flow through me the more I got! My stream of love flowed into them and theirs flowed into me and the love has just kept building and increasing! It has been like Jesus said in Luke, “Give, and it shall be given to you; good measure, pressed down, and shaken together, and running over, shall be given into your bosom: for with the same measure with which ye mete it shall be measured to you again.”(Luke 6:38 Darby). Sometimes my “bosom,” my breast, feels like it is about to explode if I try to hold it all in!!! Where the love of the Father abides in us, His fullness of joy will also be there with it. What is His commandment that we are to keep? “This is my commandment, that you love one another, as I have loved you.” We abide in Him… by abiding in His great flow of love for each other! So we see here that the “pump” that makes this river of love flow is the love of the Father and the Son and as WE dwell in the flow of their love we dwell IN THEM and are made perfect in their love. As His body we become like Jesus to this thirsty world by letting the love of the Father and the Son flow to them through us. We just read above that we are made perfect in the love of the Father and the Son. Now we see Jesus saying the same thing calling it being ONE. If a pitcher or a cistern is broken it is no longer perfect and good for nothing for it can hold no water (see Jer. 2:12-13). Through God’s love for us, we are being made into perfect vessels of His love from which He can pour us out on the thirsty and loveless world around us. It is in this same love as we abide in it that we are made perfectly ONE. 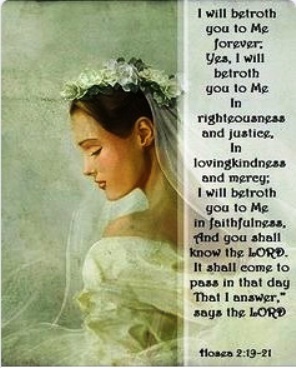 We as the Bride of Christ are making ourselves ready for His soon return by fellowshipping and abiding IN His Love! Do you want to evangelize the world? Only as we are in the unity of the love of the Father and the Son will the world know that the Father has sent the Son and how much HE loves them. When our evangelism is just so many empty platitudes and throwing scriptures at people without the love of the Father flowing through us to then, they will never see the Son for who He is and love Him because He first loves them. So, dear saints of God, pray that God might open up your hearts and heal you of anything in you that blocks the flow of His great grace and love for your fellow members of Christ’s body and for all who are starving for a touch from the Father’s loving heart. And as He heals you of your wounds you will be amazed at the love He pours through you for people that you once hated and disliked. Will We Choose Jesus Christ or a System? Dear saints, how many of us are still clinging to the traditions of men in our hearts instead of being stripped of all that and clinging to Jesus Christ and being adorned only in the wedding garment HE has provided? God will have His heavenly temple made from living stones purified in the fire and Jesus Christ will have his perfect bride who only has a heart for Him and no other. There HAS to be a terrible shaking to get us to let go of all that is not of His heavenly order and I believe it has begun. I used to think that church splits, abusive church leadership, ministers who fall into sin and delusion, and ministries that go off after obvious heresy were something terrible, but now I can see that all these things are part of God’s purifying process that drives the true believer out of that whorish system and into the arms of the One who loves them, Jesus Christ. On the one hand people are being seduced by those who appeal to their flesh and on the other we are being offered a path of rejection and suffering in this world as we seek the One who can not be shaken who is our Rock. This is the dividing of soul from spirit spoken of in Hebrews ch. 4:12. The following was written by T. Austin-Sparks in 1952 and how much more is it a warning for we who serve Christ in this late hour? The words quoted from the prophet seem yet to be capable of a fuller-ranged fulfillment than even the above-mentioned ‘shaking’. “Yet once more I shake not the earth only, but also the heavens”. (Hebrews 12:26,27). There is no doubt that the Letter to the Hebrews was a supreme effort to get Christian believers detached from an earthly form of Christianity, and attached to Christ in heaven. That effort had as one of its strong reasons the fact that a great shaking was foretold, foreseen, and imminent. That shaking was to be in two parts, an earlier and a latter; an entirely earthly, and later an earthly and heavenly combined. The effect of the shaking, and, indeed, the purpose of it, would be to test everything as to abiding values. The former and earthly shaking was Jewish, but it had all the elements in principle and type of the latter. In the destruction of Jerusalem – toward which the Letter pointed – the whole earth was shaken so far as Jewry was concerned. The Temple, as the focal point of that whole world, crashed even with the ground. The priesthood, as gathered up in the high-priestly order, passed away. The temple service ended, and the nation ceased to be an integrated and unified people. These were things capable of being removed. And yet how long they had stood! What forces they had withstood! What confidence there was that they could never cease to be! How assured they were that God was so bound up with it all that it could never be destroyed and cease to be! How they fought and clung to it to the last terrible extremity! But it was of no avail. God was no longer wanting the framework and earthly system, which had taken so much room, and energy, and expenditure, before the really spiritual was reached. The percentage of spiritual value was so small after all, and spiritual interests lay so far along the labyrinthine ways of religious machinery and tradition, that it was not worth while. The means to the end was not immediate, that is, there was far too big a distance between the means and the end. There was no immediate touch with the real Divine requirement, and there was far too much that was intermediate. And so it had to go, and, rather than preserve it, God Himself shook it. What remained after the shaking was just that, and that only, which was Christ in a spiritual and heavenly way: Christ in heaven, and here by His Spirit, the gathering point, or occasion of assembling; Christ in heaven the High Priest and Sacrifice; the order of God’s house here a purely spiritual and heavenly one – not formal, arranged, imposed, imitated, or material. Order grows out of life, and if that life is Divine, and unchecked, Divine order will be spontaneous. The amazing thing is how blind and unbelieving Christian people are, and therefore how unwilling to seek to know the way of the ‘unshakable’. In a very small part of our lifetime the phrase ‘world evangelization’ (from one part to another) has been rendered unusable, and all that mighty machine is having to be revised. Countries which were until quite recently the greatest spheres of ‘missionary’ activity are now closed as such. There is a feverish race to try to move ahead of the flood in other countries which are already encircled and undermined. In those overrun countries nothing but a true and living knowledge of the Lord is stemming the tide. The framework and organized structure of Christianity is gone. Deeply, stealthily, and irresistibly this sinister work is paving the way for swift and paralysing movements in all the rest of the world, as much in the West as in the East. The result will be the same everywhere, little as it may seem possible because of long traditions and strong establishments. It seems a terrible thing, even to think, but as we have touched so very much of what is called ‘Christianity’ we are bound to believe that, because vast numbers who call themselves Christian are in an utterly false position, and the system itself has become so largely an earthly, traditional, formal, and unspiritual thing, this world-wide shaking is quite necessary and will be eventually justified. If we were writing a treatise, we could show that what is called ‘Christianity’ is really the greatest enemy of Christ. It will be seen that it is not a matter of substituting another and better system for an old and poor or bad one. Some people seem to think that it is all or largely a matter of the order, technique, and form, and if we returned to the ‘New Testament’ form or order of churches all would be well. The fact is that, while certain things characterized the New Testament churches, the New Testament does not give us a complete pattern according to which churches are to be set up or formed! There is no blue-print for churches in the New Testament, and to try to form New Testament churches is only to create another system which may be as legal, sectarian and dead as others. Churches, like the Church, are organisms which spring out of life, which life itself springs out of the Cross of Christ wrought into the very being of believers. Unless believers are crucified people, there can be no true expression of the Church. This brings us to our particular point. What is the pressing imperative in view of this oncoming flood of testing, which has already carried away very many of those who were called Christian, and even evangelical Christians? Surely there is only one answer:- On the one hand, a ministry which has as its substance and object the “rooting and grounding”, the establishing, the building up, of believers, the real increase of “the measure of Christ”. This must get behind evangelism, so that the work is deep, not superficial; enduring, not transient; intrinsic, not general! On the other hand, believers must really take stock of their Christianity. Is it just a tradition, an assumption, an external system, the thing which is common acceptance – more or less? Or is it really “by revelation of Jesus Christ” in the heart? A real walk with God, and a growing knowledge of Christ, a life in the Spirit? God has said it: the things which can be shaken will be. What have we got that, being unshakable, will remain? 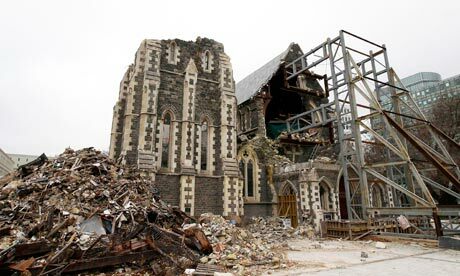 This is a picture of the quake damage at Cathedral Square in Christchurch, N.Z in 2011. What is it that is Unshakable? Surely it is NOT temples made by men to “house God.” As it was with the temple in Jerusalem almost 2000 years ago, so will it be with the last vestiges of Christendom, that artificial thing that is NOT made from LIVING stones who have only Christ as their true Foundation. So our salvation is to abide where HE is our king, in His kingdom and not the kingdoms of men. That is a parable. If the enemy can get you on to his level he has beaten you. So he must pull you down, he must get you down, he must get you to accept something less than God’s full place and mind for you, and then he will undo you. That is what he has done with the church, speaking of the church now in very general terms. He has pulled it down to this world level; he has reduced it to the level of things here, and he has absolutely disintegrated it, broken it up and divided it and robbed it of its power. The church which is revealed to us in the New Testament is always on high ground…. In Ephesians, it is “in the heavenlies in Christ Jesus.” It is a great power to be on high ground, it is a great defensive, protective factor; the enemy can do little with you if you keep up there and refuse to come down. Nehemiah found that to be so, when they said, “Come down and let us confer”; and he said, “I am doing a great work so that I cannot come down” (Neh. 6:3). It is a principle operating. I was on the phone with a brother in eastern Montana, USA, a while back and the Lord had me key-in on one statement he had made, “Most Christians don’t know what the New Covenant REALLY IS!” I immediately asked myself, “Just WHAT IS the New Covenant anyway?” I know that I had gone to many churches and sat through years in time of accumulated sermons and Sunday school classes, but had I ever heard about the nature of the New Covenant and just what makes it NEW??? So, I admitted to my friend and brother in Montana that I did not know what the New Covenant was! I new that what we see, calling itself “the church” was NOT it for sure, for it in its present day form is not found in the Bible! I wanted to KNOW! 27 Comments Posted in Abiding IN Christ, Church Relevance, Freedom, Old vs. the New Covenant, Peace, Religion vs. Abiding in Christ, Salvation, Sonship, Spirit's Guidence, The Grace of God Towards Us, The NEW Covenant!